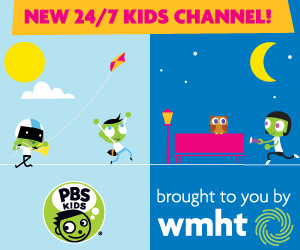 Two new episodes of Curious George premiere Tuesday, March 31 and Wednesday, April 1 at 8am and 3pm on WMHT TV. 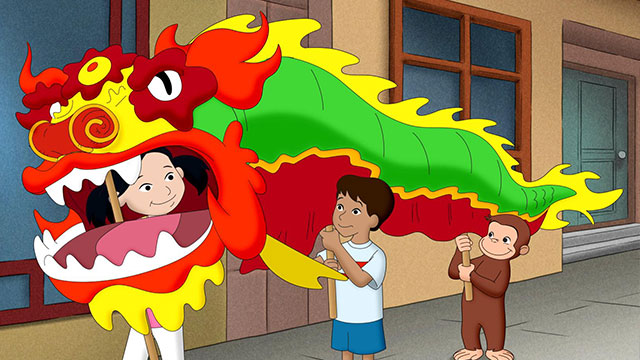 George and Marco are excited to help their new friend Lily practice the dragon dance for the Chinese New Year parade! But when they accidentally ruin the nose on the dragon costume, it’s a race against the clock to fix it in time. Can a monkey mend a dragon or will this New Years be out of luck? Monkeys LOVE bowling, especially when high scores raise money for their favorite songbird – the bobolink! But when George finds himself dodging runaway balls and flying shoes, he worries the charity event will be a bust. Could mixed-up bowling shoes be causing the chaos? To raise awareness for the rainforest, Professor Wiseman enlists George and the Man with the Yellow Hat to help make a movie about the different plants, animals, and insects that call it home. But when a frisky tamarin monkey runs off with their camera, the chase is on! Will George’s jungle instincts lead him to the camera or is the movie over before the big premiere?